DÜSSELDORF, Germany, and SINT-NIKLAAS, Belgium, 2 June 2015. Newtec, a specialist in designing, developing and manufacturing equipment and technologies for satellite communications, today announced the successful completion of a trial campaign for its Newtec Dialog® multiservice platform and Mx-DMA™ technology at Vodafone Innovation Park Lab in Germany. The tests leveraged multiple mobile traffic patterns which were delivered with exceeding quality of service made possible by Newtec Dialog. The trial also stressed the dynamic possibilities of Mx-DMA to accommodate potential fading conditions due to choice of satellite, environment (rain & dust), shadowing effects or interference and always ensuring the highest throughput and efficiency. Mx-DMA is a Newtec patented return technology that incorporates the best features of MF-TDMA and SCPC technologies and at the same time solves the difficult choice to select one or the other. Mx-DMA on the Newtec Dialog platform adjusts the frequency plan, the symbol rate, the modulation, coding and power in real-time for every terminal in the satellite network. During the demos, special focus was put on assessing jitter and latency which can seriously impact service quality. 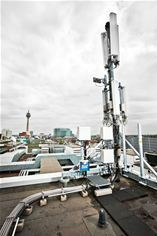 The tests results further confirm the top performance of Newtec Dialog and Mx-DMA in these fields making the combination a perfect fit for mobile backhaul. The resulting full compliance with industry standard remote stations and core equipment leads the way to eased deployments in all mobile networks. The test bed also included Sevis platforms for traffic optimization. “The results of these tests validate the strong traction in the market encountered by Newtec Dialog today”, said Newtec’s CEO Serge Van Herck. “They demonstrate that our equipment can provide high quality and profitable 2G, 3G and 4G services to mobile operators as well as ensuring a strengthened future-proof path”. The test results have been signed-off by Vodafone Innovation Park in Düsseldorf, Germany.